Boil Potatoes until just soft, peel, cool to room temperature, slice. Make your own mayo (see recipe-it only takes minutes) or use a good quality store bought product. Hard boil eggs – 10 minutes. Chop shallot or onion very finely. 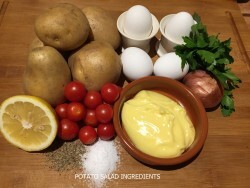 Place sliced potatoes in a large bowl, add all ingredients except tomatoes. Mix gently and add -if it does not look creamy enough- a little water at a time. Arrange on a platter or in a bowl with some greens and top with tomatoes. 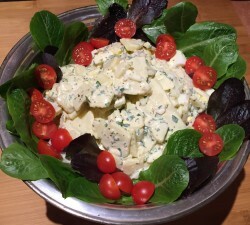 If you don’t serve the potato salad right away, be more generous with your seasoning, especially the lemon juice. It will absorb the spices as it sits. Taste and correct if needed just before serving again.